Big-budget marketing might just not be in the cards for your smaller firm, now or ever. That doesn’t mean you should toss the marketing baby out with the bath water. 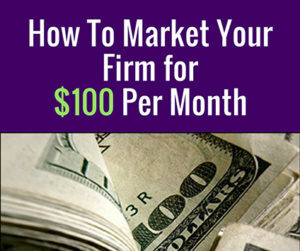 Rather, budget to spend a little each month to help keep your firm top of mind with your target market, top industry, and geography. Local listing. This is a free service on Google, Bing, and Yahoo. So, be sure to take the time to complete your firm’s local listing for each location you have. List your top services and be sure to mention an industry section you want to focus on. To see an example, search for CPA firms in any city. You will most likely see several examples. Complete a buyer persona activity. This doesn’t cost anything, but it does take a little time, possibly 30 minutes. To get a free, downloadable template, search for “buyer personal guide” or “buyer persona template”. That activity is meant to help you focus on your ideal customer’s behaviors, traits, pain points, and more. Knowing who “your people” are will help you focus your monthly marketing initiatives. If you don’t have an email service provider, consider MailChimp ($10 per month) or Constant Contact ($20 per month) to organize your client email list into segments, and to add new email subscribers to existing lists. Segmenting your email lists helps you to target messages to specific audience members. For example, if you offer individual and business tax services, your message to each audience group would be very different. With a segmented list, you can choose the emails that would go to each at specified intervals. If you have a WordPress website and already use a paid email program, like MailChimp, add a form plugin to the site (such as MailChimp for WordPress) that costs around $79 annually (less than $7.00 per month!). This automatically connects your WordPress forms to your MailChimp account so you can see what people are downloading, clicking on, and subscribing to. Then you can add those new subscribers to your email list segments. Boost Facebook posts each month for a little at $5 per day. Only boost posts on your Facebook account that point back to your website. Avoid boosting content that goes to someone else’s website. For example, if you have a new blog post on your website, boost that post to a geographic region, or audience interest. Be sure to use a call to action, such as “Learn More.” And, identify the goal for the boosted post, i.e., website clicks. Sponsor LinkedIn posts are similar to Facebook posts for company pages. You can sponsor LinkedIn content for as little as $5, but that may not reach a very large audience. Consider a budget of $20 for a sponsored post that drives traffic back to your website. You will be able to choose the geographic region, company size, industry and more to target this post to show up on people’s news feeds. Create a HARO (Help A Report Out) account for free, which aligns you with high-profile publications – basically free publicity. Each day you’ll receive a list of questions reporters are seeking content responses. You can choose by industry or specialty. When you submit a response, it may be included in the reporter’s online story. In some cases, stories are carried on sites like Entrepreneur, finance blogs, money magazine, and more. Guest blogging is another great way to reach new audience members. Though this is a free opportunity, it does take time to write the blog. However, if you follow a simple blogging formula with a headline, two sub heads, and three bullets under each subhead, and a call to action, you may be able to crank out content quickly. Be sure to work with only reputable companies to share your content. Chambers of Commerce often look for guest bloggers too. If you have a business community service provider, such as SCORE, consider hosting free workshops for their members. This gives you an opportunity to get in front of people who need your services, and to demonstrate your knowledge or specialty. This works well for people who are comfortable speaking in front of groups. Create and use a monthly blogging schedule to help you stay on track. Write and post one blog each month. Then share the blog on your social media channels. Be sure to include hashtags your target audience would use for the type of content you’re sharing. Though this doesn’t cost anything to do, it does take time. Use the same formula from item 8. Participate in Facebook and/or LinkedIn groups and share relevant company content in those groups to help spread the word about you as well as your brand. Identify the groups that resonate with your business goals, for example, expanding our presence in the distribution market in the Philly area. Then join distribution groups in the Philly area on both Facebook and LinkedIn. Monitor your posts and others to see who’s commenting on your stuff and posts you can comment on. This is free to do, but does take time. Text ads on Google or Bing for under $40 per month can help you reach those searching for services you offer. You can run as few as one ad or up to several on this budget. Some pay-per-click campaigns can be done for pennies per click. Work with a skilled PPC professional to help you set up your first campaign. And, if you have a Gmail account you may be able to get free advertising in a one-time promotion. As you can see, there are many things that can be done for under $100 per month. Some of it takes time, while others take money. Consider mixing your efforts at first to see what works best. Then capitalize on the best bang for your buck. Of these dozen ideas, which will you begin leveraging in 2017?